Background: The assessment of resident skill in laparoscopic surgery under actual clinical conditions is a difficult, but increasingly mandated process. We sought to demonstrate the utility of a new computer-based assessment tool to capture predictable incremental increases in resident skill over time. Methods: Using a network-based database instrument, performance of a group of 6 residents in a single postgraduate (PG) year at Baystate Medical Center, Springfield, MA, was assessed for 26 months starting from first day of employment (July 2005 – August 2007) for laparoscopic appendectomy (n=31) and cholecystectomy (n=31). This network-accessed multi-item assessment application (OpRate© application in Microsoft Visual C language interfacing with enterprise Oracle database) permits the in-OR entry by the supervising attending surgeon of data pertaining to 4 items of preoperative preparedness and 4 items of technical skill evidenced by the resident during the procedure. Overall performance was expressed as a mean of all items for each assessed case. Data were analyzed by multiple regression analysis, Spearman rank correlation, and Mann-Whitney test. 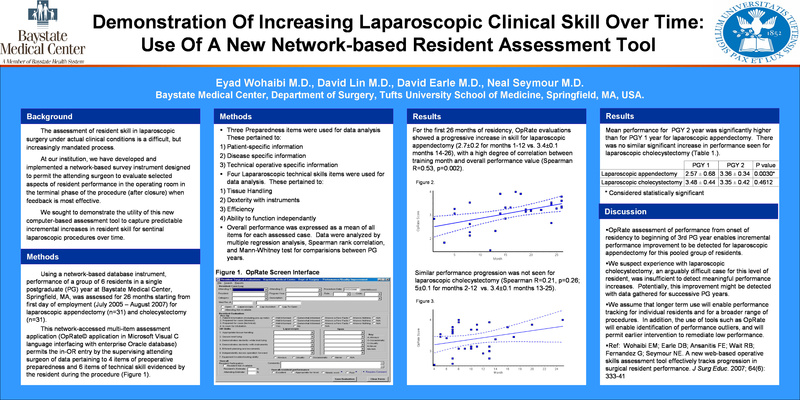 Results: For the first 26 months of residency, OpRate evaluations showed a progressive increase in skill for laparoscopic appendectomy (2.7±0.2 for months 1-12 vs. 3.4±0.1 months 14-26), with a high degree of correlation between training month and overall performance value (Spearman R=0.53, p=0.002). Similar performance progression was not seen for laparoscopic cholecystectomy (Spearman R=0.21, p=0.26; 5±0.1 for months 2-12 vs. 3.4±0.1 months 13-25). Conclusions: OpRate assessment of performance from onset of residency to beginning of 3rd PG year enables incremental performance improvement to be detected for laparoscopic appendectomy for this pooled group of residents. We suspect experience with laparoscopic cholecystectomy, an arguably difficult case for this level of resident, was insufficient to detect meaningful performance increases. We assume longer term use will enable performance tracking for individual residents and for a broader range of procedures.